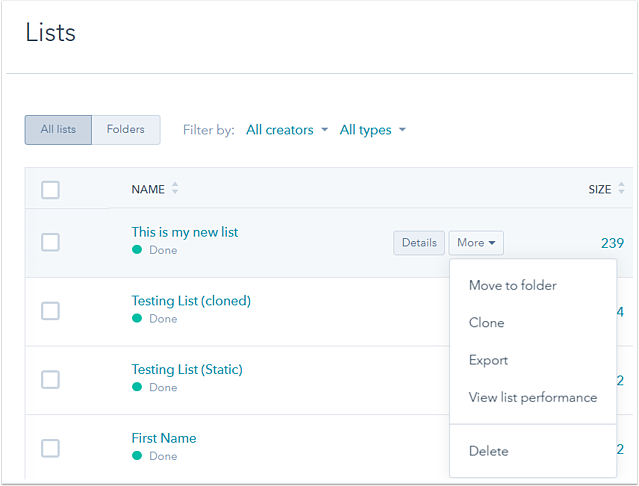 There are two different kinds of lists in your HubSpot Marketing Hub Starter, Basic, Professional, and Enterprise account: active lists and static lists. Active lists will automatically update, based on its criteria. Contacts will join the list whenever they meet the criteria and leave the list when they no longer meet the criteria. An example of using an active list is for email campaigns to a particular subset of your contacts running over time. This ensures that the list you are sending the email campaign to is always updated with new contacts who meet the criteria. Static lists do not update. New contacts who meet the criteria will not be added to the list. A static list is a snapshot of a group of contacts who meet a certain set of requirements at a certain time. Contacts can be manually added and removed from static lists. A static list helps by keeping track of contacts who met a certain criteria on a particular date. Please note: Marketing Hub Starter users can create 25 static lists and 25 active lists. Learn more about the features included in Marketing Hub Starter. In the left panel, set the criteria in the segmentation category you've chosen. Learn more about determining your list criteria. Once you've set your criteria, click Apply filter. You'll see a list of contacts start populating on the right as you begin segmenting. This is a preview of the estimated number of contacts that will be added to your list. In the upper right, click Save. Your list may take some time to process. To search for a specific contact in your list, use the search bar in the upper right. In the upper left, click < Back to lists to return to your list dashboard, where you'll see your new list. Hover over the list and click Details to view additional information about your list.